I decided to sit for the NPTE (PT Boards Exam) in April of my 3rd year of PT school. The Federation of State Boards of Physical Therapy provides the PT Board Exam 4 times a year: January, April, July and October. Since I was graduating in May of 2016, I knew that I wanted to be completely finished with my PT Licensure Exam so that I could begin practicing in June. Our program did not allow students to sit for the January exam, so the decision to take the NPTE in April was an easy one for me! Our final semester was fairly light compared to previous semesters. My wife and I were moving 2 weeks after graduation and I wanted to start applying for jobs immediately. I work best under pressure, so studying for boards while balancing classes kept me laser focused. I created this article for DPT students who are trying to figure out the best way to start studying for the PT Board Exam. This article is long, but I think you’ll find it to be helpful! If I can pass the NPTE after studying for 10 weeks, SO CAN YOU! Take as many practice exams as possible – see my strategy below! 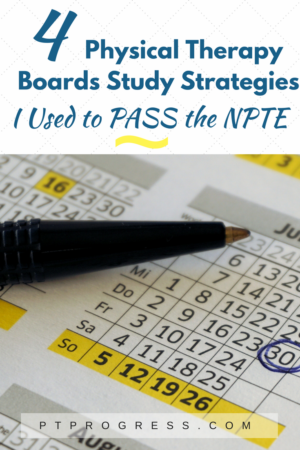 This 4 part strategy helped me pass the NPTE with a score of 692. Woohoo! What is a NPTE Passing Score? The NPTE is scored on a scale of 200-800. A 600 and above is considered a passing score. An 800 is considered the ‘highest score’ though it doesn’t necessarily mean you’ve answered everything 100% correctly. The scoring is based on a mathematical conversion of raw scores, placing them into a scale of 200-800. Don’t stress about getting an 800. You should study to get the highest score possible, but once you get your passing score, you should celebrate! Fun fact: Two students in our program passed with an 800 score. Many others passed with scores above 750! I’ll provide the tips and study suggestions from two of those students in this article! Having a study calendar kept me on track and gave me the confidence I needed to pass the NPTE on my first attempt! You will feel overwhelmed by the amount of content covered in the textbooks. Having a study calendar is the best way to cover ALL the material in the NPTE. 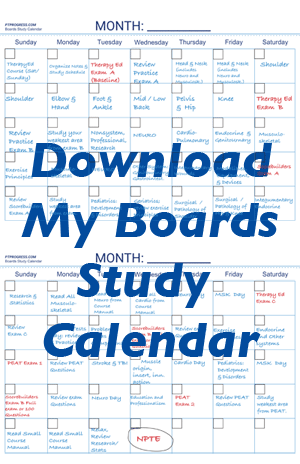 You’ll get a copy of the calendar I used as well as a blank study calendar you can use to plan your studying strategy to ACE your PT Boards Exam. Download my study calendar. Success! Now check your email to confirm your email and to download the calendar. In January, our program hosted an instructor from TherapyEd to host a weekend review course for the NPTE. On the TherapyEd website, the course costs $265, but it may vary for you. I’ve heard of some programs even covering the cost of the course for their students. The course was a two day event and included the small “TherapyEd Course Manual.” This smaller book was an abbreviated ‘quick reference’ guide for a lot of topics covered in the large TherapyEd book. I found this small guide to be particularly helpful to highlight the “big picture” for the different boards topics. It was also nice because it included chart breakdowns for specific neuro and musculoskeletal impairments. Should I sign up for the TherapyEd Course? Yes, I would. If I had to do it all over again, I would still sign up for the TherapyEd course. Here’s the thing: I wanted to pass my boards on the first time. The course gave me a structure to follow, helped me to understand test taking strategies that actually helped me, and motivated me to step up my studying so that I could pass the NPTE on my first try. Plus, the first day of the course you are provided with the “Course Manual” the small guide I referenced above (it costs about $90 on Amazon). When it comes to choosing a study guide for the NPTE, you’ll find a few different options out there. I actually purchased a few of the books below, but don’t feel like you need to buy multiple study guide. Hopefully the summaries below will help you in deciding which book suits you best. This was my primary study guide and I would highly recommend it to students taking the NTPE. Based on my study calendar, I would use the O’Sullivan book as my first line of defense. The sections were presented in an outline format, which was helpful for digesting the material quickly a second and third time around. The outline format felt a little repetitive at times, but I think breaking up my studying by body region then system helped to keep things in focus for me. Take a look at my study calendar to see what worked for me. Most of all, I found the practice exams and explanations in the back of the book to be very helpful. Each book contained 3 practice exams. I took one of the practice exams before studying (to get an idea of my ‘baseline’ knowledge) and spread out the other two exams over the following month. This book came with the TherapyEd prep course, but you can also purchase it on Amazon. The material in the guide would be very helpful for someone even if they don’t attend the course. I won’t say the book is a substitute for the course as my course instructor shared some very valuable advice not found in the book. However, the course manual would be worth purchasing and using as a supplement tool to quickly review each system and area covered on the NPTE. Worth noting: the course manual does not come with any practice exams. It’s basically a small summary of the major systems and topics covered on the NPTE. I personally purchased and read through the ScoreBuilders PT Exam text because I was freaking out a little about boards. My rationale was this: If spending $70 on the ScoreBuilders book helps me to understand a topic well enough to answer a few questions correctly, it could be the difference between passing and not passing. Maybe I was freaking out a little, but there were a couple of things I liked about the ScoreBuilder’s text. The book came with an additional 3 exams – this was a great supplement for my frequent test taking strategy. The ScoreBuilder’s book also included a lot more images and was formatted in a way that was actually easier for me to read. A few of my classmates used Scorebuilder’s as their primary text for studying. I feel that I got the most out of it by referencing it along with the other text, but again, that might be overkill for some people. I did not use either of these guide, but I thought I’d still include them here because they’re popular resources as well. From what I’ve see of the McGraw-Hill text is that it’s heavy on text and light on images. To be fair, the TherapyEd text lacks images as well, but is formatted as more of an outline. I personally did not purchase the NPTE Flashcards, though I’m sure they would be helpful. I was a big proponent of using flashcards in school – I used Quizlet a lot. In fact, I found a pretty helpful set of flashcards on Quizlet for PT Boards studying. A quick search of “NPTE” on Quizlet will reveal a lot of flashcards. A word of caution: be careful with using flashcards made from other people. They’re human too! I found a few mistakes in some of the flashcards I used, but 99% of the cards were accurate. Part of my study strategy also included using an online NPTE prep course to supplement my studying. Two of the more well known online PT Boards courses are: Therapy Exam Prep and PT Final Exam. I used PT Final Exam and wrote about my experience in this article: PT Final Exam Review. Here’s the thing: both courses will provide accountability, motivation, and the resources you need to get you on the right track in your studying. The Best Part: I think the best part about taking the PT Final Exam course was that it provided some structure and guidance for me to ramp up my own study guides. I worked hard to actually complete the assignment within the course, and feel that it helped me in understanding quite a few major concepts. I understand that these courses aren’t cheap. But neither is failing the NPTE, paying to retake the exam, and losing out on income while you wait for the next available exam. There were quite a few students enrolled in the course because they couldn’t afford to fail the NPTE again. If you’re on the fence about an online PT Boards course, read through my experience here. Looking back, I think it was the best thing for me because I knew I needed to put some serious effort into my studying. Not all exams are created equal. You’ll quickly learn that the practice exams are quite different from each other. The TherapyEd exams are notoriously more difficult than the ScoreBuilder’s exams. I scored a consistent 70%+ on the Scorebuilders exams, which seemed to be easiest of the exams I took. The PEAT exams weren’t necessarily easy but seemed to be more straightforward than the TherapyEd exams. After taking a 4 hour practice exam, you’ll feel exhausted. I devoted days on my study schedule to take the exam and the following day to review the results. There were some days that I found myself reviewing the test immediately after taking it, but I think it’s better to spend a couple hours reviewing the incorrect answers when your brain isn’t so tired! In the two days leading up to taking the NPTE, people recommend taking it easy and “not touching your notes.” I’ll be honest with you: I didn’t do that. I used the two days before my exam to review my notebook that had my hand written summary notes for each body part. As I studied the main texts, I used a notebook to summarize ‘big picture’ items for each body part – from the brain to the ankles. Reading through my own notes helped to reinforce that I had put enough time and effort into the exam and that I was ready to pass it. The day of the actual exam was interesting. I felt like I knew the material, but when I left the testing center I felt awful. I felt like I had failed the exam. Let me share something with you: everyone feels like they failed. After the exam, it is very common to feel like you’ve just been chewed up and spit out. Don’t freak out. There’s nothing you can do in worrying about how you performed. Try to direct your attention to other things – easier said than done, yes. I found out my scores in 7 days, but that is considered quick. Within 5 days of taking your exam, FSBPT will send your scores to the state/jurisdiction you elected to apply for a license. Within 10 days, your score should be available. What If I Don’t Pass the NPTE? Change up the way you studied the material – don’t just read a book to check it as completed. As I mentioned earlier, two students in our program scored 800 on the NPTE and multiple students scored ABOVE 750 on the exam! I reached out to these students and they wanted to share their tips below. Tips from Emily, an orthopedic Physical Therapist in Michigan and 2016 graduate of Washington University in St. Louis, MO. 1. Find a good time of day to study and stick with it. For me, it was 5 in the morning…no one was sending me text messages so my phone was silent, it was dark out so I couldn’t procrastinate by staring out the window, and I wasn’t already tired from a busy day of other tasks. Find that time of day in which you will be most effective in your studying and take advantage of it. 2. If you are feeling burnt out, take a break! Studying for the NPTE is a lengthy process. If you are having a day where you just don’t want to study, take the day off! Go for a run, ride your bike, spend time with your friends, etc. In my experience, trying to force studying while you are feeling burnt out just adds to the problem! It’s okay to take the day off because it is going to improve your productivity later. 3. Don’t neglect reviewing the information that you received in your PT classes—you learned it for a reason! I based more of my studying off of the NPTE prep book; however, while taking the test, I realized that I could have benefitted from a little more review of my general class material. 4. Don’t try to mimic everyone’s study tips/habits. Everyone is going to be talking about how they are studying, the practice exams that they are taking, the books that they are using, etc. Don’t let it rattle your confidence or change how you are studying. Do what works for you because everyone is going to have different preferences! 5. Take practice exams but don’t stress about your score too much. Use those practice exams not only as a judge of knowledge but also as a way of determining what your attention span is for test taking. I found that I did better and felt more focused on the practice exams if I took a short break after every 50-question block. So that’s what I did when I took the NPTE—definitely helped me stay alert and focused through the test. Tips from Jenna, a pediatric Physical Therapist in South Carolina and 2016 graduate of Washington University in St. Louis, MO. I approached my boards studying like someone would when training for a marathon. I created a 12 week plan that focused on specific topics each week. Once I created the plan I stuck with it. 1. Focus on the content, not the hours you’ve studied. Instead of trying to study a certain number of hours each week, I spent as many hours as it required to really know the topic I assigned to myself for the week. I spent 6 weeks on the big three subjects: Neuro / Ortho / Cardio and 6 weeks on everything else. 2. Take a practice exam early and schedule them into your study program. I used a TherapyEd exam as a baseline test before starting the first 6 weeks of studying. After I completed the first 6 weeks of my program (covering Neuro, Ortho, and Cardio) I took a second TherapyEd exam. I took the third TherapyEd exam mid way into the second half of my study program. About 3 weeks prior to the NPTE, I took a PEAT exam to really learn where I was and where I needed to focus. 3. Know the boards study book well. Very well. I personally used the TherapyEd book and feel like it was extremely valuable for the exam. I never studied a single thing outside of that book (like class notes), but i knew that book very, very well. I’m sure other prep books are good too, so pick one and really study it. 4. I highly recommend taking a prep course. I attended the TherapyEd prep course and felt like they shared valuable information on how to budget time for each topic, how questions are created, and strategies for guessing and using deductive reasoning when you’re stumped. 5. Consider meeting with a small study group. I’m a group studier, so I felt that I gained a ton of benefit from studying in a small group of 3. We would do our weekly assigned learning independently and then meet every Friday to discuss it and to clarify or review hard topics. We also went over every practice test and PEAT exam to discuss the answers and why we missed things. Passing the NPTE wasn’t easy – at least for me it wasn’t! I put in a lot of hours and hard work every week, averaging 3 hours a night in studying. But the feeling of passing the exam was absolutely fantastic. If I could do it, I know that you have a great shot at passing it the first time too. Put in the work and take your studying seriously, and I’m sure you’ll do well.